One of the main ideas of SlideFab 2 is to empower the user. Historically, Powerpoint slide automation or Powerpoint slide mass-creation from Excel was the domain of VBA coders: Some adept coder developed and implemented a VBA (Visual Basic for Applications) application or a macro. This worked. However, most ordinary Excel users do not code these kind of custom-tailored solutions. It is just too difficult, error-prone and time-consuming. The risk is just too high that it won't work out in the end. Consequently, instead of automating these tasks, users solve them manually. This means copy & paste. Lot's of copy & paste. So, SlideFab 2 is about giving the power of slide making automation without coding to any Excel and Powerpoint user. Imagine a dinner buffet: People need to walk to the buffet and grab their food. Then they get back to their table for eating. Afterwards they walk again to the buffet for the next round. This is not how SlideFab 2 works. The principle of SlideFab 2's iteration loop is more like à la carte dining. People stay at their table and the food is served to them - round after round. So, SlideFab 2 lets the Excel model "serve" the data before it is "consumed" to Powerpoint. When one (or more) slide(s) for each element of a list shall be created, SlideFab 2 expects the Excel model to prepare the data, e.g. texts, tables, charts, etc. So depending on the current list element, the data for the current Powerpoint slide changes appropriately. In Excel this works as follows. 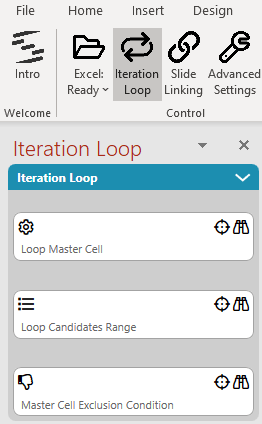 There is a central Excel cell called Loop Master Cell. All dynamic elements (e.g. texts, charts, tables, etc.) which shall be exported to Powerpoint depend on the content of this Loop Master Cell. So when its content change these dynamic elements will change as well. In most cases this is achieved through formulas which incorporate the Loop Master Cell. Typically, these formulas are lookups, e.g. VLookup or Index/Match. For the automation part SlideFab 2 will change the content of the Loop Master Cell. Because changing its content will update all depending dynamic elements for the Powerpoint slides. For this endeavor SlideFab 2 uses the elements which are found in the Loop Candidates Range one after the other. As a consequence, this approach makes sure that for each element in the Loop Candidates Range one (or more) slide(s) will be created. Maybe the slide automation needs to filter out certain, inappropriate elements from the Loop Candidates Range. This is where the Master Cell Exclusion Condition will help. In this field a cell containing a formula needs to be referenced. If the formula results to 1 or true, everything is fine. If not, then the automation won't create any slide. SlideFab 2 will check this condition every time after putting the next element from the candidates range into the Loop Master Cell. Accordingly, the formula in the exclusion condition should be (indirectly) based on the loop master range. Imagine a simple scenario of name tags. You have a list of names in Excel and want to create one slide per name for all names starting with "A". So as Loop Candidates Range you will use the list of names from Excel right away. As Loop Master Cell you define an arbitrary cell, which can be empty. SlideFab 2 will write to this cell, so anything in there will be overwritten anyway. Then you will need to write a function in a separate cell which checks whether the just defined Loop Master Cell starts with an "A", e.g. =left(C1, 1) = "A" assuming that C1 is the Loop Master Cell. The formula containing this cell will be the Master Cell Exclusion Condition. This is all it takes to define the SlideFab 2 iteration loop. When making slides, SlideFab 2 will create one slide per name. Afterwards the definitions made in the Slide Linking side pane will help to bring the names from Excel to Powerpoint.